Some of the greatest writers in the history of the English language -- writers like Emily Dickinson and Edgar Allan Poe -- were all-but-unknown in their own time. Only seven of Emily’s poems ever saw the public eye during her lifetime, and Poe spent most of his days desperate to make ends meet. They were both brilliant writers, but they suffered from a critical failure to market (among other things), and their works -- pieces of literature that form the foundation of many language classes today -- languished in obscurity. Fortunately, the age of the internet has taken power out of traditional publishers’ hands and put it back into the individual’s control, allowing creators to shape their own paths and make names for themselves on their own terms. There’s never been a better time to be a creator, and avoiding the fate of an undiscovered great is easier than ever before if you’re trying to break into the market by selling digital downloads. Which is where this article comes in. Today, we’ll walk through a four-step system for promoting your digital downloads, so whether you’re putting a new ebook on the market or selling creative assets, you’ll land your first customer -- and many more like them -- in no time. It starts, of course, with figuring out exactly who that customer is. Part of the beauty of the internet is the ability for like-minded but distant people to come together in digital pockets. Unfortunately, with a population that’s pushing eight billion, those pockets are harder and harder to narrow in on. Which is why we recommend researching your audience before you start creating a product for them so you can pre-sell your goods. But if you’ve already prepared a product, don’t worry: you can still market to your future customers effectively, you just need to put in a little homework and find them. And it does have to be in that order. While blogging and SEO can draw customers to you, if you’re a first-time creator, you’re going to have to find them first. Now here’s the good news: someone else has already done the work for you. In fact, finding your audience is as easy as finding your competitors. Known as competitive analysis, you can scope out your rivals with a quick Google search. Here’s what I mean. 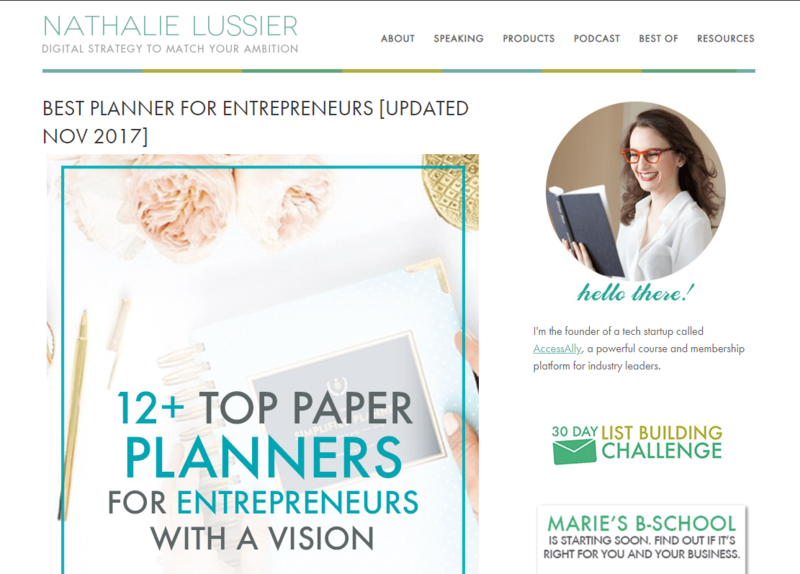 Let’s say you have an idea for a product that will help other entrepreneurs manage their time -- maybe it’s a printable planner. You’re passionate about maintaining a healthy schedule and want to help others do the same. 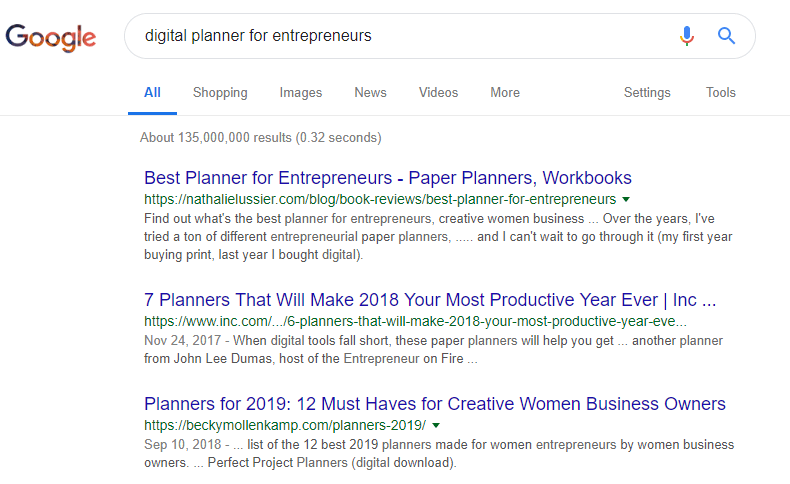 You start with heading to the trusty Google homepage and typing in a relevant keyword string -- make it something specific to your idea like “digital planner for entrepreneurs” -- and then look at the top results. How do you know these are your competitors and they’re worth a look at? Because they’ve done the legwork to compete for the same keywords that your prospective customers will use to find you, and whatever they’re doing, it’s working well enough to send strong engagement signals back to Google. You won’t find subpar entries in the first ten organic entries on Google’s search engine results page (SERP), I guarantee it. It has a ton of backlinks pointing towards it from other websites -- there’s a reason backlinks are one of our quick-wins for search traffic. 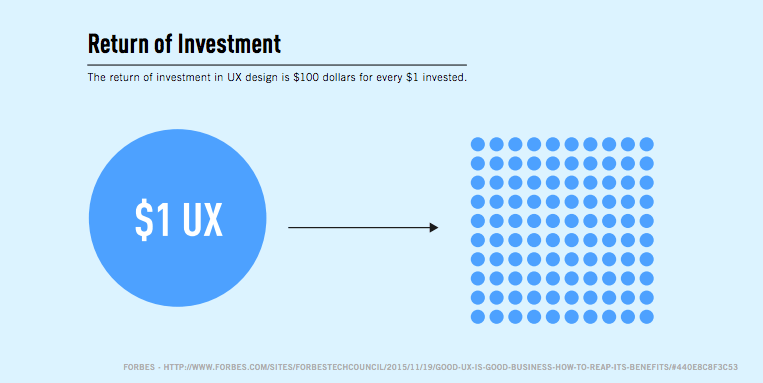 The website/page’s user experience (UX) is smooth enough to encourage dwell time. The content is comprehensive, and in most cases, over 2,300 words. All of which is both great news and a challenge for you. It’s great news because it means you can look at what they’re doing well and follow their audience to find your own, while it’s a challenge because it means your competition is well-entrenched in your niche. Fortunately, you only really need to focus on the first three entries on the SERP. 55% of all clicks go through those, with each lower ranking receiving less and less user attention. But, let’s set aside the intricacies of page ranking and get back to your audience. Start by following the first link on the SERP. In this case, it’s a list-style article for paper planners. Now, scroll down to the bottom of the page where the comments section is to find a treasure trove of audience information. They want something aesthetically pleasing. They identify as planner addicts. 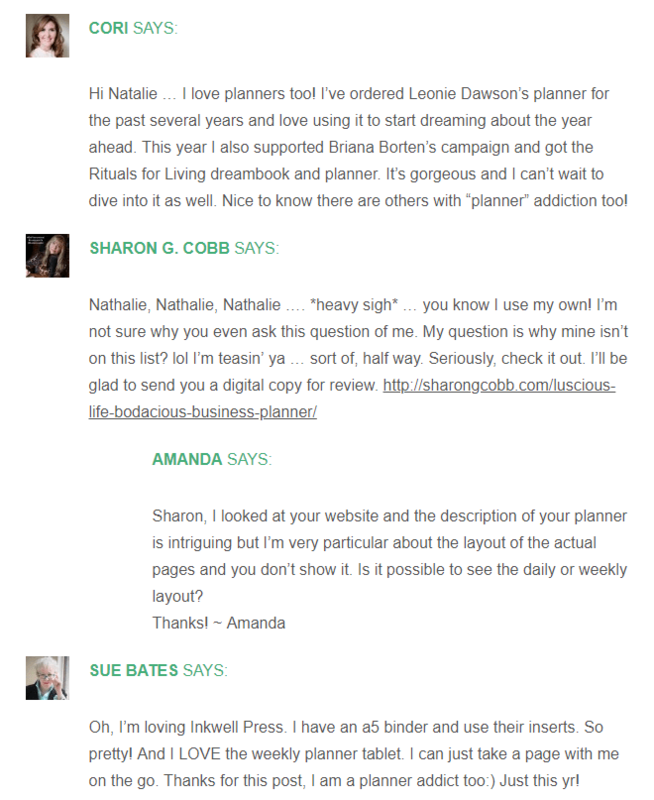 They want to be able to see the layout of the planner before committing to a download. From here, go back to the SERP and look at the comment sections on the other two top-ranking pages. Do you notice similar themes? Are people voicing their frustrations and identifying challenges that your product can help solve? Be sure to check out the social profiles of the websites in the first three slots, by the way, for even more audience insights. 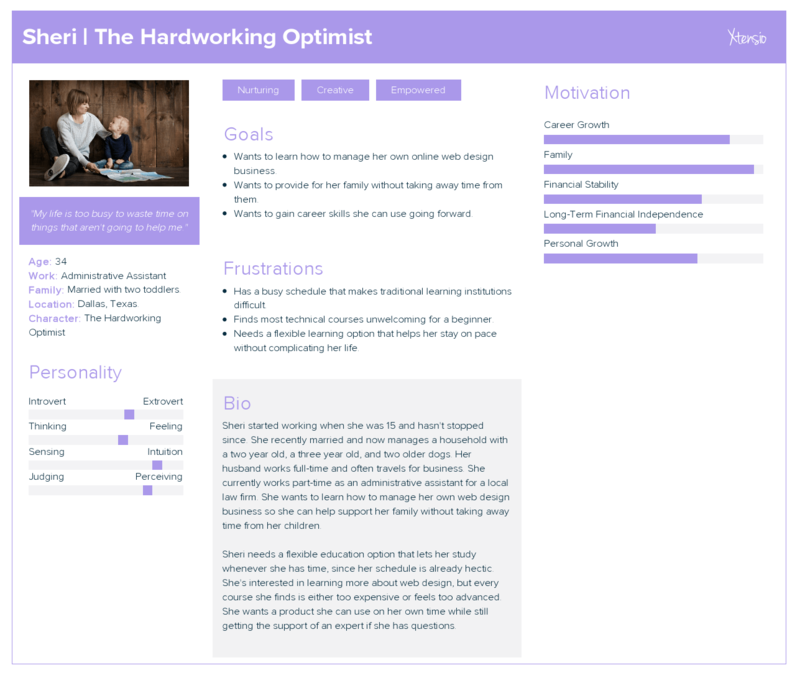 Then, use all of that information to create audience personas (if this is your first time, you can find a step-by-step guide to putting together your first persona in our previous article about marketing strategies for online products). While personas are an important step, they can’t be the only one -- and they can’t be used in lieu of real customer and audience interactions. Designing anything, whether it’s a product or promotion, in a vacuum is much like that saying about putting monkeys in a room with a typewriter. Yeah, you might get Shakespeare out if you wait long enough, but it’s not scalable or predictable. You have to talk to the people who will be in your audience to fill in the gaps and challenge your assumptions, which means joining the conversations they’re already having. 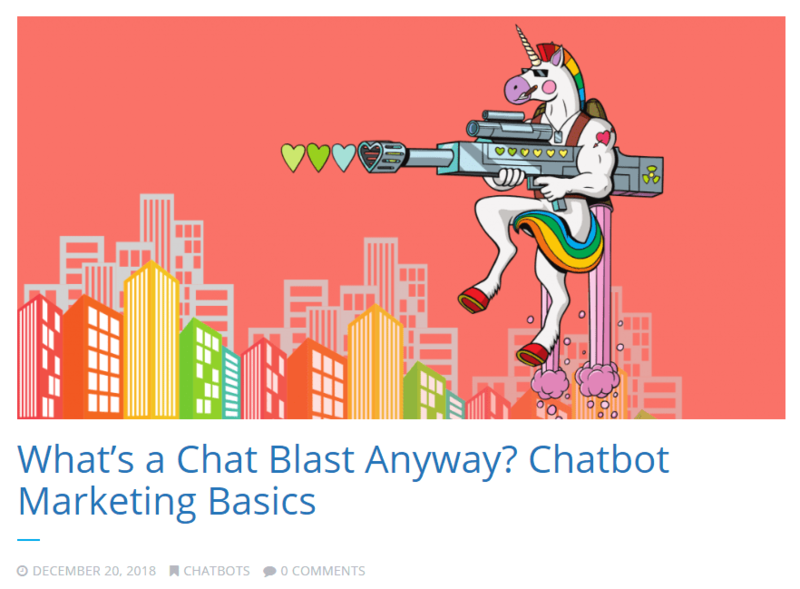 The easiest way to do this is with a combination of social listening and hashtag tracking relevant terms with a tool like HashAtIt (check out this article on choosing and validating a membership idea for another detailed walkthrough of how to use it). Is it more work than dreaming up an ideal customer from the top of your head? Absolutely. Is it worth it? Building personas with real audience data and shaping their promotions around those personas helped the Adecco Group “wake up” around 90,000 leads they wouldn’t have otherwise reached. Combine that with the fact that 66% of marketers say they struggle to understand their audience and 39% of professionals say that improved understanding of their customers is their top priority, and the answer is clear. It’s not just worth it to research your audience and build actionable personas, it’s critical for success. It’s also an absolute necessity for moving onto the second step -- the packaging. That’s not quite true, though. While digital downloads may not live inside leatherbound covers, their packaging -- the way they’re presented and the window dressing that sells them -- can make or break first impressions. So at this stage, armed with your customer research and personas, you need to create packaging that appeals and impresses prospective customers without overwhelming them. The elements of your sales page, which is the packaging that wraps around your digital download, should inspire trust and intrigue in equal measure. And a lot of that -- more than you’d think -- comes down to design. 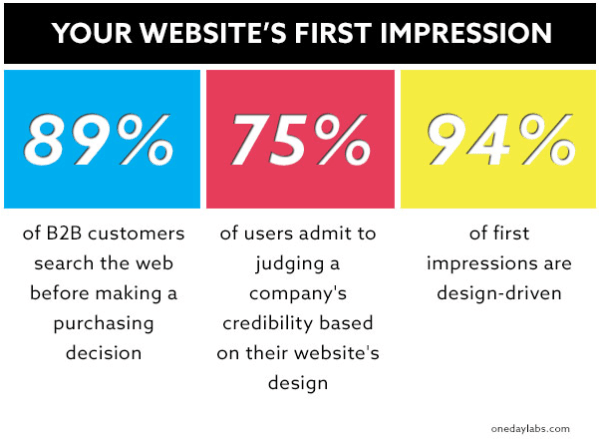 94% of a user’s first impression of your business and/or digital download is dictated by your design decisions. Ironically, this makes the packaging for digital products even more paramount than it is for physical products. At least with paper products, ‘only’ 70% of your potential customers will judge the merit of your brand based on the packaging. And while it’s impossible to give design recommendations on a broad-scale -- it’s all audience-dependent, hence why you can’t skip the first step -- there is at least one abiding rule to follow. No matter what, the packaging around your product (the visual design, the copywriting, the navigation, et cetera) must be usable for the users it’s intended to serve. I.e., the language has to be readable, the calls-to-action have to be clear and directive, the layout has to make sense, and the performance has to meet user expectations. Those are fairly steep expectations, by the way. 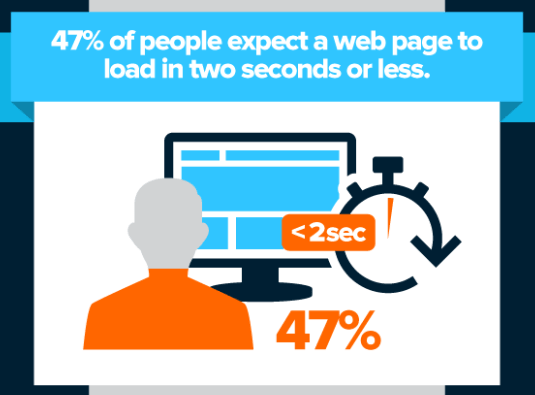 47% of users expect a website to fully load in two seconds or less, something that creators trying to hack it all together with WordPress plugins will find challenging if they don’t have a premium (read: expensive) hosting package. But that’s not to say meeting those demanding expectations doesn’t pay off. For every dollar spent towards creating better, more seamless user experiences with smarter design, $100 is returned, which gives it one of the highest ROIs of any marketing or promotional activity out there. At least, that’s what practically every business -- from HubSpot to Bank of America -- discovered when they created designs that catered to their specific users. So no, digital products may not have packaging in the most traditional sense, but the design of the delivery system around them isn’t something you can afford to overlook. Nor is the content that nurtures users into becoming customers. Now, you have to work on bringing people onto those pages. It’s not as simple as throwing a link out there with a hashtag. While some products do indeed go viral, very few successful and sustainable businesses were built with lucky timing. Indeed, most experts agree that virality is an application of skill rather than luck. So if you want to get traffic and shares, you need a content plan built around your personas that encourages and educates users until they’re ready to convert into customers. Let me be clear: content plans are slow-burn strategies. They don’t bring you overnight success, but they do compound over time, and when well-executed, move users through the sales funnel painlessly. 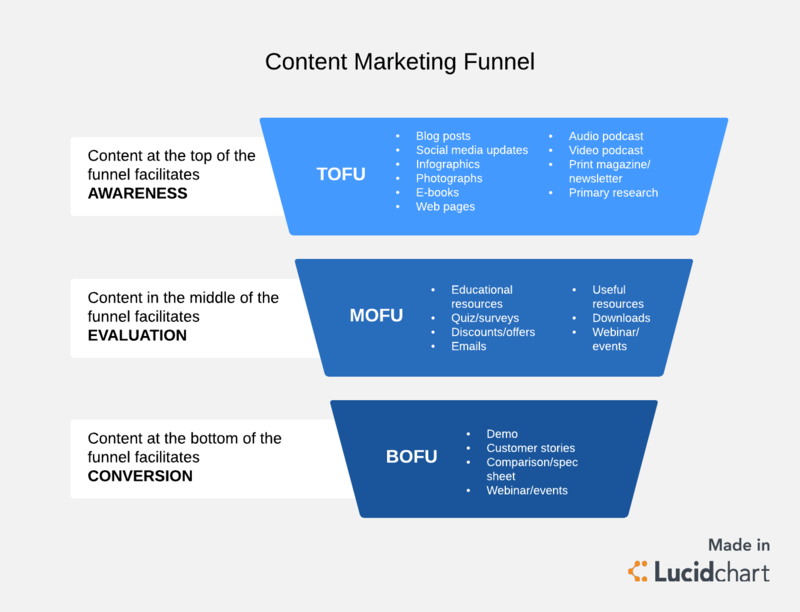 At a minimum, your content plan should include content to take people from the first stage of the funnel -- awareness -- to the last, conversion. Why? Because 95% of consumers will choose a business that provides content to move them through every stage of the funnel. And moreover, it’s not hard to create and execute great content that does just that. Even if you don’t feel like you’re much of a writer (you’re probably a better writer than you think), if you understand your audience better than your competitors, then you have an opportunity to upstage them with your content plan. 63% of customers say they’ve interacted with disappointing content from a brand, so there’s no question about it: the person who does their research and listens to the audience more will create better content. Suppose that you’re creating a platform for messenger marketing for small businesses. At the top of the funnel, your purpose is to educate visitors about what messenger marketing can do for them. 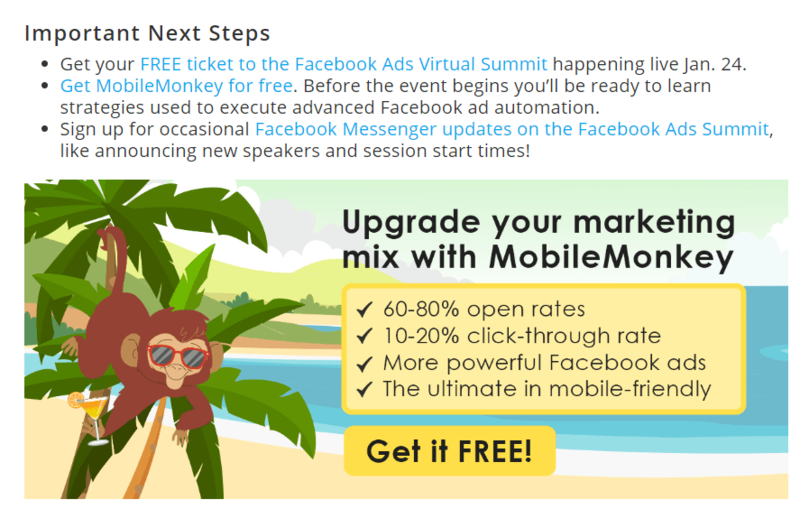 So you’d probably want to start with a piece of content explaining the basics like you see MobileMonkey doing below. Then, you’d create middle-of-the-funnel content to deliver more resources and deepen the prospective customer’s understanding of the concepts. It’s even better if you give them a trial run with the product, such as a one-page planner template. 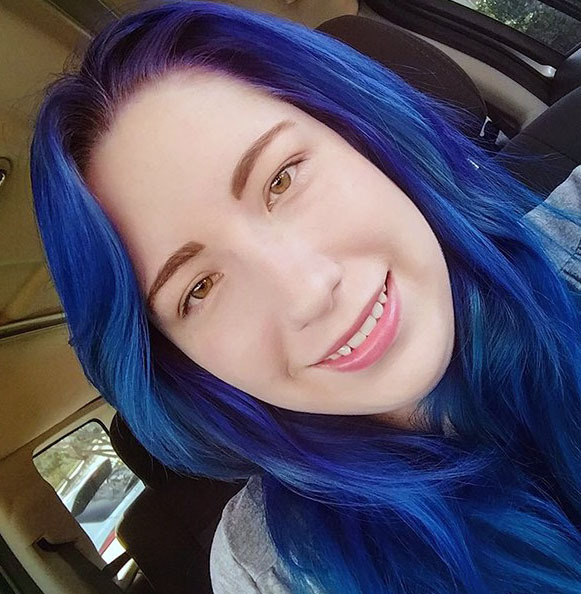 For MobileMonkey, they offer a free spin of their platform and resources for more education to move users out of awareness and into the evaluation stage. 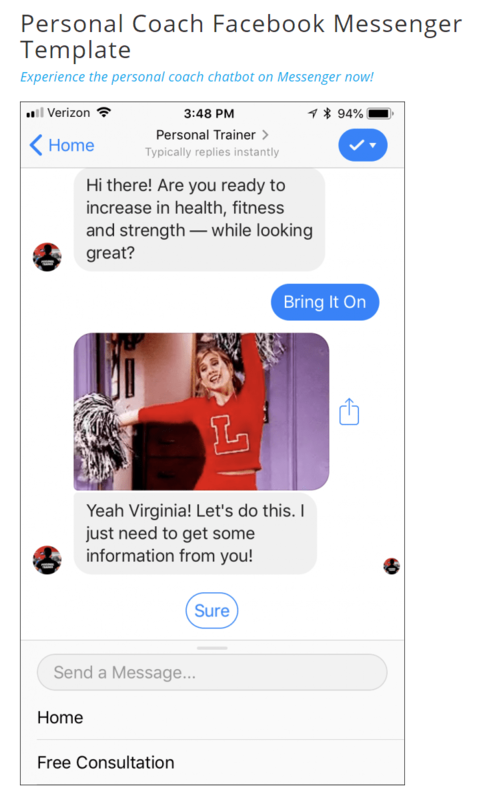 After users have entered evaluation, MobileMonkey then shifts to bottom-of-the-funnel content by providing interactive demos (we use a similar approach on Podia) with chatbot templates. For a digital product creator, this might take the form of a promotional webinar or another kind of interactive event depending on the audience’s preferences. There are no immutable rules about what a content plan should include. The only guiding precept you need to remember is that as long as there’s content in the plan coinciding with each stage of the funnel, it’s a plan that will cater to users whether it’s their first visit or their fifth and keep them moving towards conversion. And if you're looking for a more hands-on approach to content planning, I highly recommend this content planning template from HubSpot and Smart Insights. It’s free, easy, and incidentally, it also beautifully demonstrates how to create content for users who aren’t ready to convert. They’re not selling anything with this content, but they are smartly capturing a lead -- me -- moving through the evaluation stage and putting me squarely where you want your audience to land with your content. The value of an email list for selling digital products really can’t be understated. For instance, if I were to come across a case study that reported an 830% ROI for social media or copywriting, I’d tell you to check your math again. But when it comes to email marketing, that kind of ROI isn’t just believable, it’s the real results from a company that sells paper bags. 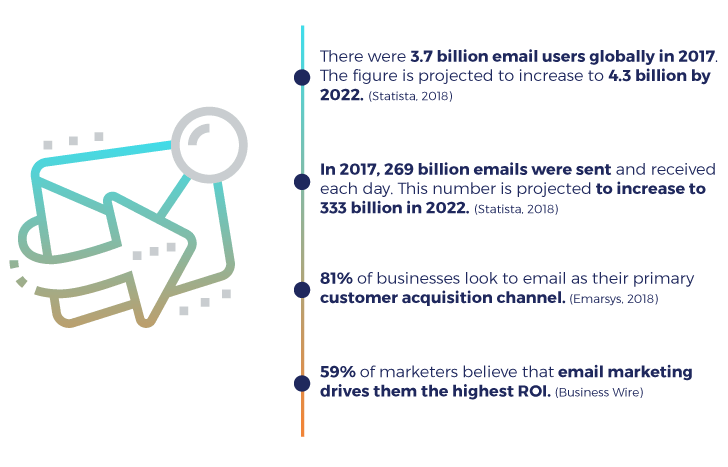 Granted, the average ROI isn’t quite so high, but the fact nonetheless remains that email marketing is the top-performing channel out of all forms of marketing, including the channels we’ve talked about today. So why do marketers love email so much more than any other channel for marketing? 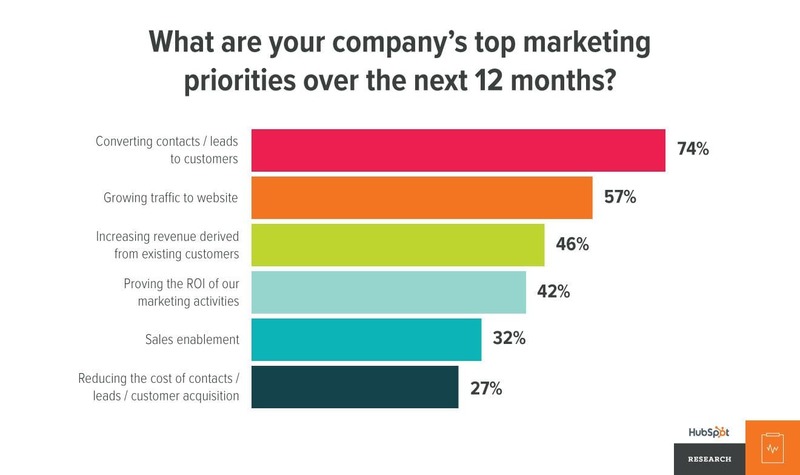 For the same reasons you’re going to love it, too: because their top marketing priority is to convert contacts into customers. 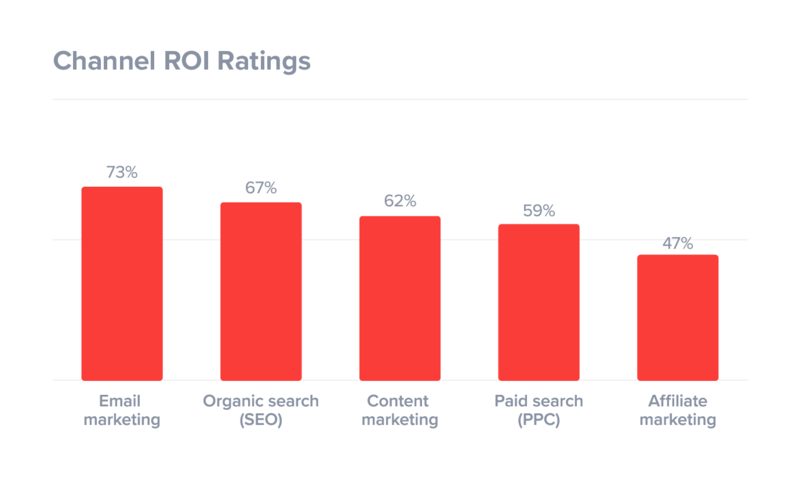 And a majority of marketers -- 59% of them -- say email delivers the highest ROI. Your audience research shapes your product and promotions. Your product and promotions shape your content. Your content leads people to sign up for your email list. Your email campaigns, driven by your business goals, send people to different stages of the funnel by delivering content on an automated (drip) schedule. It really is that straightforward. Pair this process with the right email marketing templates, and your digital downloads won’t just survive -- they’ll thrive. And more importantly, they’ll bring your profits along for the ride. Marketing is a skill that doesn’t come naturally to a lot of people, but that doesn’t mean it’s unobtainable. In fact, thanks to the internet, it’s easier than ever to take the reins on your marketing and make a name for your products. Start with creating data-backed audience personas so you know who you’re selling to and designing promotional materials for. Don’t use personas as a cop out from customer interactions, though. The best products and marketing campaigns are built from real conversations with real people. After you have a firm grasp on your audience, prepare the packaging around your product -- the website, the marketing messaging, and et cetera -- to suit their tastes. While there’s no hard-and-fast design guideline for packaging, there’s at least one rule you can’t break: whatever you create to sell your product has to be usable for the people you want to buy from you (which is why you have to understand them). Once your sales page is ready for your audience, you need to create and execute a solid content plan. At its most basic, your content plan should include material that nurtures visitors through every stage of the funnel from top to bottom. As for delivering that content and greasing the funnel, an email list is the perfect channel with a seriously impressive ROI. Set up a separate email funnel to direct users between the stages and nourish them until they’re ready to convert. If you market your products with the steps in this plan, you’ll have more than prospective leads on your hands -- you’ll have people as eager to be your customer as you are to have them convert. And that, I think we can all agree, is the perfect symbiosis between creator and customer.